The following testimonial is from an individual stating what results he experienced on Jon Barron’s Liver Detox at the Baseline of Health Foundation. From almost the moment I was born in 1943 with childhood asthma, I have had health problems. For the most part they were manageable (although I was confined to the house for 9 months a year during pollen season) with the use a respirator and inhaler until around 1984. It was around that time, that all of the systems in my body started to break down. The first thing I noticed were the intestinal problems — both upper and lower GI. As it turned out, it would be another 15 years of suffering before the doctors would identify the intense “high up” pains I was having as a gallbladder problem. But in 1984, the one thing they could identify was that I had diverticulosis throughout my colon, along with several polyps. Unfortunately, as they told me then, I was “too sick at the time” for surgery to correct the problem, so I had to live with that problem too for another 15 years before I would be able to correct it. In 1988, things took a turn for the worse. I discovered I had suddenly developed severe allergies to a whole range of chemical substances and additives when I died in a hospital emergency room from anaphylactic shock for the first time. As it turned out, omnipresent substances such as MSG, Sulfites, and Yellow dye #5 were suddenly deadly to me — even in minute amounts. Fortunately, the doctors were able to bring me back to life through the use of large quantities of steroids, epinephrine, and Benadryl. It turned out my allergies were so severe that one day I ordered a fast food hamburger without pickles (because pickles contain yellow dye #5). It turned out that the restaurant took a hamburger that had pickles on it and pulled the pickles off. I was so sensitive to the dye that just the amount of #5 in the pickle juice still left on the hamburger was enough to take me down. I died for the third time later that same month. And for the third time in less than two months, they brought me back to life in the emergency room. You might wonder how I could keep eating these foods that were so deadly to me. The answer is simple. I had no idea how omnipresent they were. MSG for example is present not only in Chinese food, but also in virtually all canned soups and chili. But even worse, in many cases it’s not on the label. For example, how many times have you seen a package that listed hydrolyzed vegetable protein, or autolyzed yeast, or textured protein, or glutamic acid, or any of a dozen other ingredients on the label? Well, I had no way of knowing, until it nearly killed me, that each and everyone of these contains MSG. Hydrolyzed protein, for example, is as much as 40% MSG by weight. As for Sulfites, they’re present in virtually every kind of restaurant potato (including fries and hash browns) and in virtually every food that comes from a vending machine. And yellow dye #5 can be found in everything from cake mixes to relishes and sauces. The bottom line was that suddenly, virtually every single trip to a restaurant was a dance with death. My wife Mary became an expert at going back to the kitchen and grilling the chefs on how they cooked their food and where their ingredients came from. Nevertheless, over the next 10 years, I was forced to go to hospital emergency rooms on literally hundreds and hundreds and hundreds of occasions. Each time, I would sit in the emergency room to see if the Benadryl would prevent my going into shock. About a third of the time (which still amounted to several hundred occasions) it did not, and I had to be given the steroids and epinephrine to prevent death. As a further complication, around that same time I started developing severe bronchitis and bronchial pneumonia that kept me on continual antibiotics and required frequent hospitalization. It turned out that the trigger for that was secondhand cigarette smoke. This presented major problems because many of my family and friends and co-workers (I was employed as a truck driver until 1996, when I was no longer able to work) were heavy smokers. In the end, thanks to superhuman efforts of my wife, Mary, and despite the hundreds and hundreds of trips to the emergency room, I survived until 1997. Sometimes I wonder how she survived all that stress — like the time she happened to look in the emergency room just as the nurse was frantically scrambling on top of my gurney, straddling my body, and pounding away on my chest…trying to bring me back. Unfortunately, in 1996, things got worse again. First, I developed cataracts from all the steroids they were giving me in the emergency room. I also developed a tear in one of my retinas, and then a detached retina. In the end, after a series of surgeries, I was left with severely compromised vision — no longer able to drive. Also, as a result of the surgeries, I began having frequent severe headaches that would keep me up all night and require 4 Tylenol and hot packs to get any relief. Then, in 1997, I started developing tremors which got progressively worse and worse as time went on. And finally, in 1999, the bottom dropped out. I came down with the flu. My immune system was now so depleted, there was nothing left. Between January 6th and March 15th, I came down with the flu 5 different times — each time for at least 2 weeks. I literally was in bed for over 2 months, virtually non-stop. It was at that point, when I was at the lowest of the low, with tremors so bad that I couldn’t even pour medicine into a spoon without spilling it, that one of my wife’s co-workers, Jolene Mapes, sent me a miraculous gift — a bottle each of Colloidal Minerals and Immunity Plus. And life turned around. First, the Minerals and the Immune Boosting formula (and the Pathogen Destroyer that I added to the program), took care of my flu. In the year and a half that I have been using these products, I have not had the flu again at all. The tremors that I had were mostly gone in 6 months…and totally gone in 12 months. By this time, I was doing the whole Baseline of Health® program. I did the Colon Detox program twice, then had a colonoscopy done to check on my diverticulosis and the polyps. After the procedure the doctor gave us a picture of my colon showing just three or four small pockets left — clinical diagnosis: no sigmoid diverticulosis and no colorectal polyps, a major improvement. Surgery was no longer required. At the end of that year, my gallbladder problem (which had remained undiagnosed for 15 years) hit full force. On New Years Eve, I had a granddaddy of a gallbladder attack. When my wife got me to the emergency room, I was treated as if I were having a heart attack — I was given nitro pills. When the first one didn’t relieve the pain, they gave me another one, and that one nearly stopped my heart. My blood pressure plummeted; my pulse rate dropped; I passed out. The last thing I remember was them tilting the bed I was on, and someone holding my feet up in the air. A sonogram revealed five “huge” gall stones. It was now just a question of when surgery would be scheduled. But by now, I was a firm believer in Jon Barron’s program. 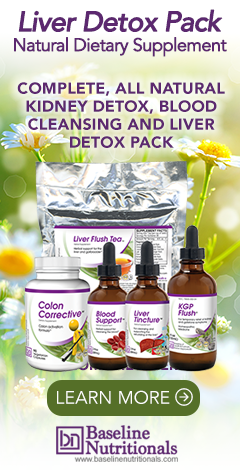 I decided to take on my gallbladder problems with a Liver Detox and Blood Cleanse. About the third day into the Detox, I was beginning to wonder if I had made a fatal mistake –The Healing Crisis had arrived. I thought I was going to die. But once I made it through. Voila! All pain was gone. I now eat anything I want without fear of having another gallbladder attack. And I still have my gallbladder. (Although I did think Jon Barron was going to have a heart attack when I told him I was now eating chili, sausage, bacon and burgers & fries.) Oh yes, another major benefit I got from the Liver Detox and Blood Cleanse was that the mind bending headaches I had been having ever since my eye surgery totally disappeared. I haven’t had even the hint of a headache in the last 6 months. And as for my anaphylactic shock? Last April, I was at a convention to hear Jon Barron speak. After, the convention was over, several of us were able to join Jon and Kristen Barron in the hotel restaurant for a final visit. A bottle of wine was ordered. I felt so confident that even though it said right on the label that it contained sulfites, I had a glass. NOTHING!!!! I had NO REACTION!!!! This is beyond incredible. Enclosed are the reports from my doctor substantiating the above statements and the lab tests showing that my hepatic function panel levels have dropped substantially between the report on 1/1/00 and the one on 3/24/00. My bilrubin level, which had been slowly climbing over the past few years, is now back to normal. This is a miracle!! I would not be alive today without the Baseline of Health®. PS: Please tell Jon Barron that I am now behaving and not eating chili, sausage, bacon, and fries.